In the 1960s the world turned upside down and everything began to change. At the Cornish level, net out-migration was transformed into net in-migration. A new demographic regime of counter-urbanisation began and continues to the present day. This was marked by movement from the suburban wastelands of England to the rural periphery – in England but also in Wales and Cornwall. Despite a slight fall in the 1950s, population still rose rapidly over the full 30 years from 1951 to 1981, by a quarter. The biggest rise was felt in Bodmin, where political leaders had welcomed planned ‘overspill’ from Greater London in the 1960s, in a vain and forlorn attempt to bring ‘prosperity’ to the town. 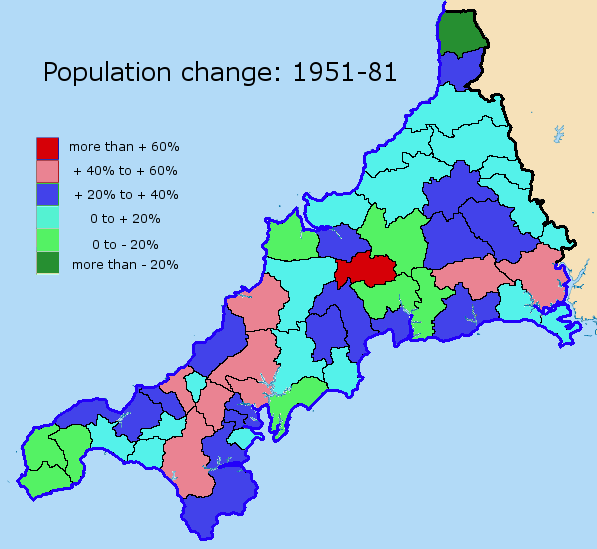 The other places where population rose by 40% or more included a swathe of country to the west from Helston north eastwards through Truro to the coast at Perranporth. This was joined by another area in south east Cornwall, where Plymouth-bound commuters added to the growing strain on the infrastructure. Despite this general rise of population, a few rural districts retained the older pattern of depopulation, notably in West Penwith and in the countryside either side of the lower River Fowey. 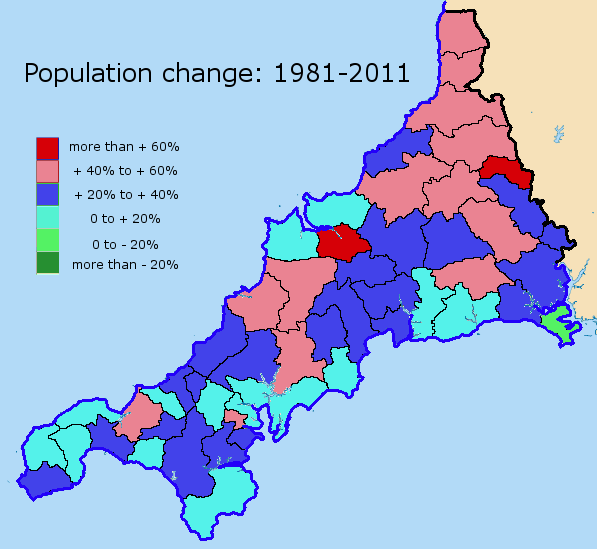 The last 30 years since 1981 have seen an ongoing and apparently unstoppable population growth, as another 23%, or 100,000 people, joined the growing numbers in Cornwall. While the very rapid growth rates of the 1960s and 70s were not to be matched again, a continuing demand to move to Cornwall was now fuelled by images of ‘lifestyle Cornwall’ as well as experiences of happy holidays in the sun rain. Only one district – Torpoint and Rame in the far south east – saw a population fall in this most recent period. And this was the result of the special circumstances associated with the rundown of Royal Navy establishments near Torpoint. Everywhere else had to come to terms with population growth, a growth made more obvious by greater mobility, encouraged by out of town supermarkets, new roads and the commercialisation of leisure pursuits more generally. While no part of Cornwall was immune from population growth, the highest growth was seen in and around the eastern towns of Wadebridge, Camelford and Launceston. East Cornwall generally grew at a faster rate than the coastal parts, where an influx in the 2000s of second home buyers crowded out other more permanent in-migrants.